The Summer Collection from China Glaze is always highly anticipated, and this one is no exception. 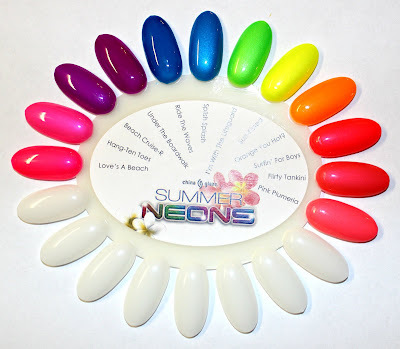 12 bright neon shades--if that doesn't scream Summer, I don't know what does! At the bottom of the press release information is a quick nail wheel shot to give you an idea of just how gorgeous this collection is. Don't the shades look like they're lit from within? i dont really like neons but this collection looks so pretty! Can't wait to get my hands on some of these. I love neons.